The Marais (Maray) literally means the marsh or swamp in French. Much like D.C. this area was a wet swampland early on it it’s life. 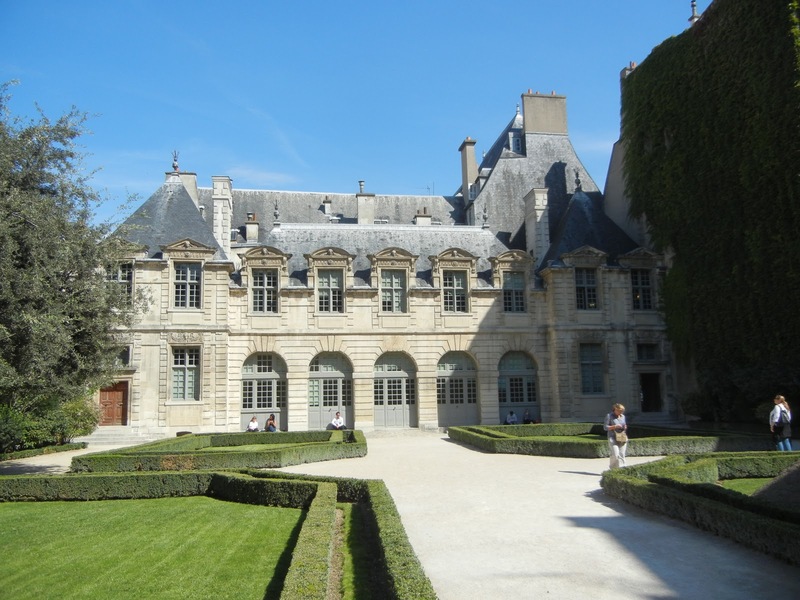 By the 17th Century it had become the center of aristocratic life in Paris. 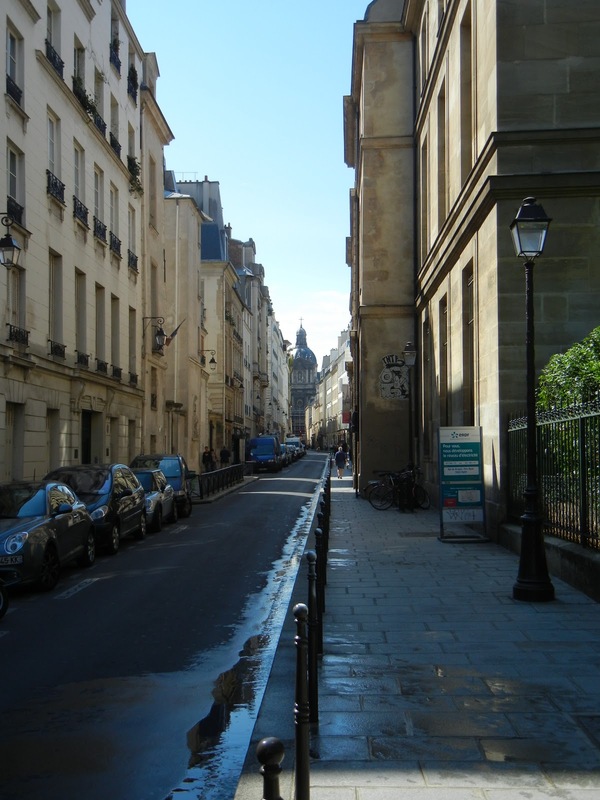 During the industrial revolution the fashionable people moved across the river to St. Germain-des-pres and industry took over this 4er arrondissement. In the 1960s there was talk of destroying many of these 16th and 17th Century homes, but luckily that didn’t happen and this area is fashionable again. It is also the gay center of Paris — although unlike Boystown in Chicago, I couldn’t really tell that it was the gay-borhood (I didn’t see any phallic obelisks, go-go boys, or hear any loud dance music at all while in this area. You all know, my go-to travel guide is Frommer’s (I’m not plugging these folks because I get compensated or get anything free from them, I just like their books). Frommer’s had a self guided walking tour of the Marais in the book, so since MS wasn’t meeting me for about 4 hours after I arrived at the hotel and JB/RK were clear across the City checking into their own hotel, I decided to do the tour myself and get acquainted with my new home for the next 4 days. Every Frommer’s tour always says it will take so much longer than it really does. The Marais tour says it will take 4.5 hours with only brief stops en route. I was done in less than 3 and I stopped for 40 minutes for lunch. 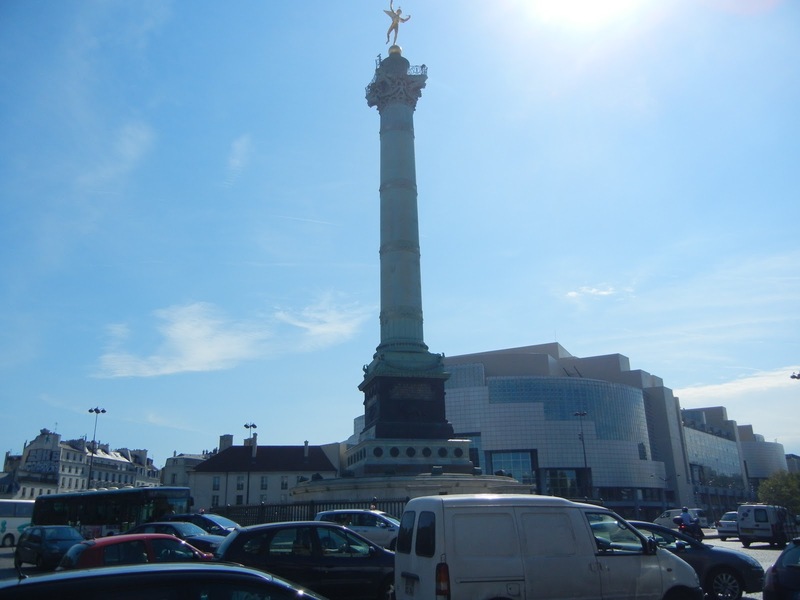 The first stop was the former site of the Bastille — it has long been destroyed. Interestingly enough, when it was stormed in 1789, there were only 6 prisoners inside — it was all symbolic. The people weren’t going to take the oppression any more. Paris built it second Opera House on the side of the Bastille, this modern building looks great, but I do wish the old Bastille was still around to see. 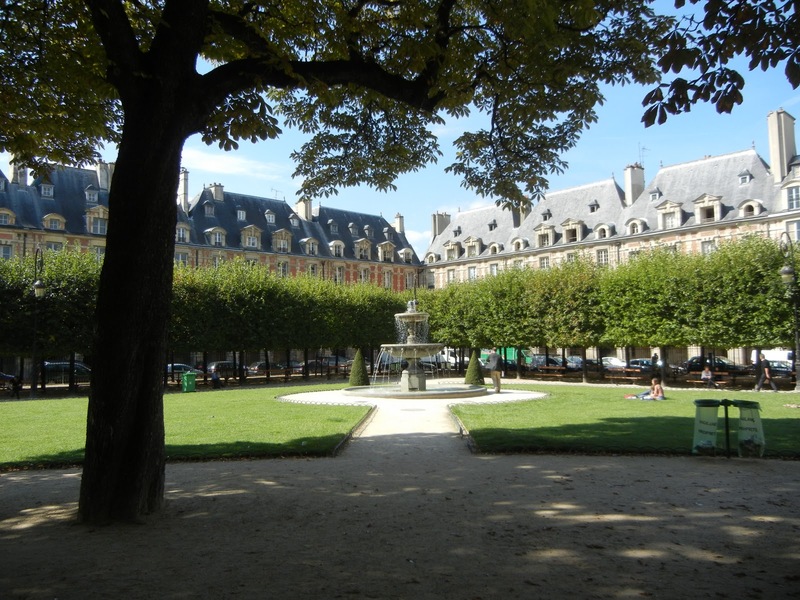 Continuing along the tour route (I will not be discussing everything on the route, just the things I found interesting and have a cool associated picture), was the Place des Vosges (Plas de vohj). It is the oldest square in Paris and contained covered shopping arcades to allow the people the ability to shop during all types of weather. The mansions that lined the Place were occupied by the aristocrats, until Louis made them move to Versailles so he could keep an eye on them. Victor Hugo also lived here and his house is open to the public. I stopped off at this little Creperie for lunch. While only using my limited French I ordered the menu lunch, a glass of wine and a carafe of water. No hiccups whatsoever. I even ordered dessert and got the check without an issue. One thing I never got use to was not tipping. I think traditionally I am an over tipper in the US. 20% is standard for me. If you frustrate me you’ll get about 15% and only if you REALLY piss me off while I give you 0%-10%. 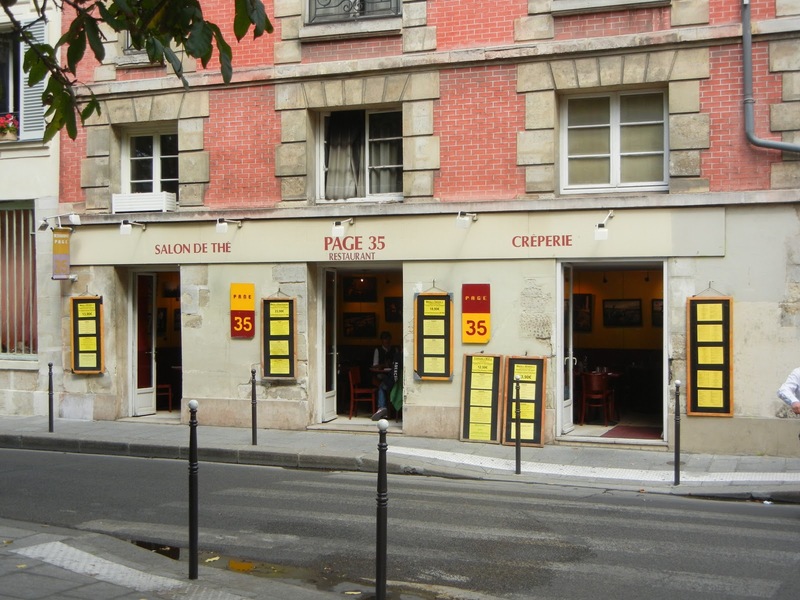 No one expects a tip in Paris-the service is already built into the prices. I still felt like a jerk without leaving a couple Euros on the table — but I didn’t leave any. When in Rome…er Paris, do as the Parisiennes do. Further along the walking tour route we come across the Picasso Museum, which is closed until 2012. Now that’s definitely disappointing. I love Picasso. Oh well, I guess I’ll just have to enjoy his works from memory of my trip to Amsterdam in 1999. The tour continues winding through the streets of the Marais stopping in small art galleries, butcher, cheese and flower shops, cute little boutiques and even fabric and antique stands. We wind our way back to the St. Paul Metro Station (HEY! This is looking familiar now!) winding our way closer to the Seine to find Hotel des Sens, which today is a public Library. 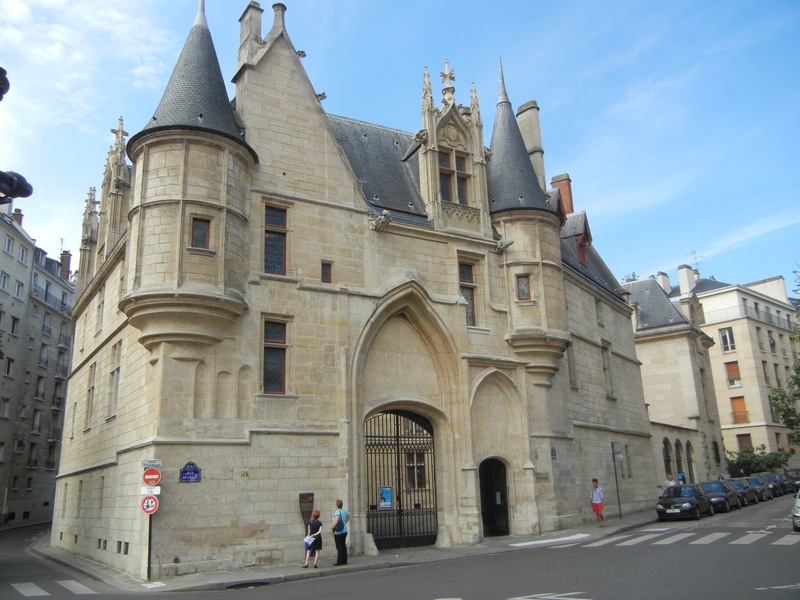 This was once the mansion for an archbishop and is the only remaining piece of 15th century architecture in Paris. If you look closely you can even see a cannon ball stuck in the wall from an attack in the 1400s. This was the end of the walking tour and MS was to be arriving in about an hour, so I decided to head back to the hotel and see what else the neighborhood had to offer. If we continued across the Seine, we would have about a 4 minute walk to Notre Dame, the Latin Quarter and about 10 minutes to St. Germain-des-pres. The Marais was a perfect neighborhood to stay in. Chicago friends stayed in the area in May and they chose it because it was the gay area. I just didn’t see the gayness, I did see the greatness though. When I return to Paris I think I will stay here again. It had much more of a neighborhood feel than a tourist trap. All the cafes and restaurants we tried were filled with the French, not Americans. The food was good, the service was attentive (but not overly so) and the price was right. I cannot say enough great things about this area. You must stay there on your next visit and give me a full report on what you though. If you need a hotel recommendation, just look here! What is your favorite neighborhood in Paris? Do you prefer to be closer to the action or to stay as the locals stay when you travel? Where should I eat next time I stay in this area, or anywhere in Paris for that matter? By Tim in Travel on September 18, 2011 .